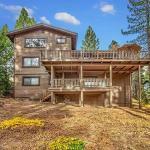 Lupine Lodge 2410LT Home is a holiday home with a barbecue situated in South Lake Tahoe. Guests benefit from balcony. The kitchen comes with a dishwasher. A TV with satellite channels is offered. Other facilities at Lupine Lodge 2410LT Home include a fitness centre. You can play tennis at the property and the area is popular for golfing. Heavenly Ski Resort is 3.6 km from Lupine Lodge 2410LT Home while South Tahoe Ice Arena is 4.4 km away. Reno-Tahoe International Airport is 69 km from the property.